So, you did jailbreak your iTouch and did install some fun or useful stuff via the Install.app … but then, suddenly, the next program on your wish-list fails to install ??!! I know you hate to do drastic things to your iTouch, but sooner or later you’ll have to do it, so why not NOW? The problem is that there are two disk partitions (a small one, meant only to host the apple-software and a large one to contain all your music, videos and stuff) and Install.app installs programs in the /Apllications folder on the smaller partition. So, we want to move it to the other partition using a symbolic link trick (as in the wiki-hack post). Here a walkthrough, more details can be found on Koos Kasper’s site. Have BSDsubsystem and OpenSSH installed, so that you can ssh into the iTouch. From now on, all (most) new programs are installed on the larger partition. If you reinstall the OpenSSH application (as suggested) make sure to remove on your computer the old key for iTouch. 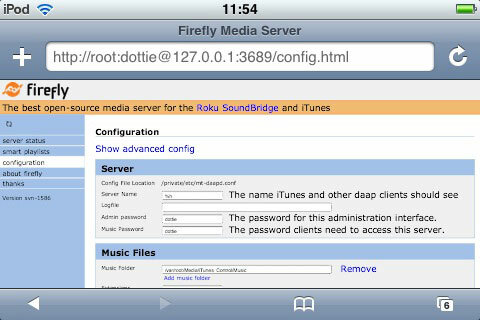 Relaunch Install.app and install FireFlyMediaServer (under Multimedia). Now, at the Mac your iTouch should be vusible under Shared in iTunes, click on it and give the password and your music is available!